As we already know from this blog, I’m a hugely petty person. It’s a source of much mirth for my family that I watched the film Dunkirk simply to prove my sister’s boyfriend wrong about it. What can I say? He was wrong and I wasn’t about to let him get away with it. So, yeah, pretty petty. 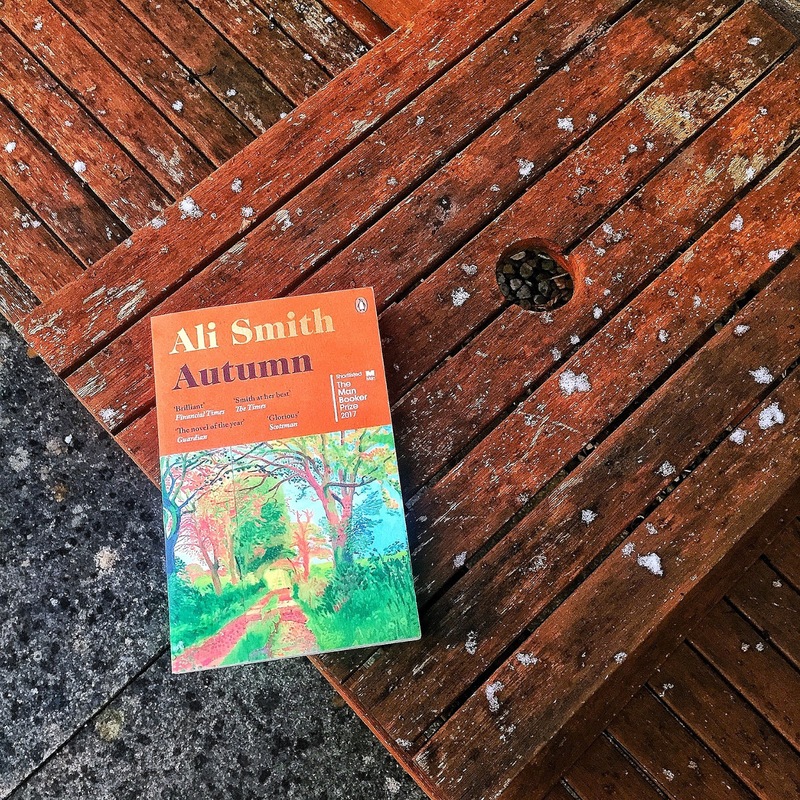 Therefore, it shouldn’t come as much of a shock that the only reason I finally decided to read Autumn by Ali Smith was due to my need to prove someone wrong. An account I follow on Instagram didn’t exactly react well to the news that Lincoln in the Bardo had won the Man Booker Prize last year. That, in itself, wasn’t enough to incense me despite the fact that I thought George Saunders was absolutely deserving of the prize. I get that Lincoln was a divisive book and understand why some people may not have enjoyed it. It’s not conventional literature and a lot of people prefer the safety of a traditional narrative. It was only when this person made the bold statement that Autumn was the only book that deserved to win that I couldn’t ignore it. I mean, how can anyone make such a bold and obstinate statement? I had to check it out for myself. Autumn is the first in her Seasonal series of novels and, having been written and published so quickly, is being hailed as the first post-Brexit novel. Autumn is, at its heart, a story about time and how human beings experience the passing of time. Slipping between time frames it tells the story of the strange friendship between Elizabeth Demand and Daniel Gluck. When they first met Gluck was an old man and Elizabeth his young neighbour. They meet thanks to a school project and continue to spend time together against her mother’s wishes. Daniel sees a certain brilliance in Elizabeth that he attempts to bring out in her. Several flashbacks reveal the games they played and the conversations they had. Years later, Elizabeth describes it as love but without ever crossing any boundaries. It’s an odd but intellectually bound relationship that has not been weakened despite the pair being apart for years. In the novel’s present, Elizabeth has made contact with Daniel again but, unfortunately, he spends his days in a coma at a hospice. Elizabeth, now a 32-year art history lecturer, visits Daniel, aged 101, and reads to him. During their formative years Daniel made sure Elizabeth was aware that it was important to always be reading something. All the while, Elizabeth is coming to terms with society after the key vote that decided the United Kingdom would leave the EU. It is a turbulent time where neighbours have turned against each other and houses are being painted with messages to ‘go back to where you came from’. In between the fragments from these two people’s loves, the novel explores what life is like in a post-Brexit world. Now, I’ve never read anything by Ali Smith before so I wasn’t sure what to expect going in. If I’m honest, I thought it would be much harder to get into Autumn but it’s an incredibly easy book to read. I love Smith’s way with words and the way the narration flits between subject matter. It is a very poetic and beautiful example of how to use language and I absolutely adored the writing. I’d be tempted to describe it as high-literature posing as low-literature if that didn’t insinuate that certain types of literature are better than other. It’s an exciting book to read and there are some lyrical moments that left me almost breathless. It is something that could very easily have alienated readers but Smith mostly manages to keep things on an even keel. The novel is, at times really funny. The scenes that take place as Elizabeth attempts to get her passport form checked are standout moments. These scenes showcase the tiny, frustrating aspects of modern life that eat away at our existence. Elizabeth spends important moments in her life waiting to be told that her face is too big and to come back tomorrow. As Smith is keen to remind us, time is constantly moving onward and it is precious. Everyone experiences ageing differently and their personal concept of time is skewed. We are always experiencing time travel in our memories, which is why the novel flits between the past, present and the near-death dreams of Daniel himself. It’s clever and a great read. However, I can’t say that I agree it deserved to read the Man Booker. I was genuinely surprised by how much I enjoyed this novel and think Smith is a great writer I will read more of. Did it deserve to be shortlisted? Most definitely. It just didn’t engage me as much as Lincoln in the Bardo. As much as I loved the language it became a bit much at times. I love literary novels but this felt like literary for literary’s sake. I mean, yeah I get the passage of time thing explains the narrative structure but it’s such an overdone technique that I felt short-changed. Occasionally, I could help but feel like this novel was written for people who like to think they’re taste in literature is better than others. I mean the main two characters are the epitome of artistic elitism. Elizabeth and Daniel live in their own world and delight in the things they see that others don’t. There were times when I could imagine Smith being stood in a pulpit surrounding by her literary cult spouting out these words to the brainwashed few. It just all went a bit too far. I love reality and fiction melding but didn’t really feel that the inclusion of Pop Artist Pauline Boty was entirely successful. It could have worked better but it felt forced in places. I’ve been through so many ups and downs with this novel. Firstly, I kind of wanted to dislike. Then, after reading the opening, I really wanted to love it. Now, I just don’t know what I think. I loved most of it but can’t escape the feeling it could have been more. But, maybe I’m just missing something? Maybe I’m not literary enough for Ali Smith?